Q: Whose key was in Margot's handbag? Q: If Tony wrote the blackmail notes, wouldn't Margot have recognized the handwriting? This is a fine example of the kind of mystery that little old ladies from Pasadena (or Russell Square) adore. Perhaps Arsenic and Old Lace (1944) starring Cary Grant might be comparable in its gentile and bloodless ability to glue us to the screen. This is certainly one of Hitchcock's best, but most of the credit must go to a devilishly clever play written by Frederick Knott from which the movie was adapted. (He also wrote Wait Until Dark (1967) starring Audrey Hepburn.) Hitchcock does a good job in not tinkering unnecessarily with the material. He also has the exquisitely beautiful Grace Kelly to play the part of Margot Wendice. Ray Milland plays, with a kind of high-toned Brit panache, her diabolical husband, Tony Wendice, a one-time tennis star who married mostly for security. John Williams is the prim and proper Chief Inspector Hubbard. He lends to the part a bit of Sherlock Holmesian flair. One especially liked his taking a moment to comb his mustache after the case is solved. Robert Cummings, unfortunately plays Margot's American boyfriend as inventively as a sawhorse. For those of you who might have blinked, Hitchcock makes his traditional appearance in the photo on the wall from Tony Wendice's undergraduate days. The fulcrum of the plot is the latchkey. It is the clue that (literally) unlocks the mystery. There is a modernized redoing of this movie called A Perfect Murder (1998) starring Michael Douglas and Gwyneth Paltrow in which a similar business with latchkeys is employed. 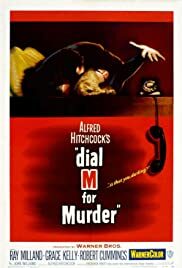 I am not very good with clues so it was only after seeing that movie and Dial M for Murder for the second time that I finally understood what happened. Follow the latchkey! Of course I was too distracted by Grace Kelly to fully appreciate such intricacies. I found myself struck with the ironic notion that anyone, even a cuckolded husband, might want to kill Grace Kelly or that a jury might find her guilty of anything! She remains in my psyche America's fairytale princess who quit Hollywood at the height of her popularity after only five years and eleven movies to become a real princess by marrying Prince Rainier of Monaco. Something was lost there, and something was gained. She was in essence the original Jackie Kennedy Onassis. I think, however, that the old saw about the man who marries for money, earning it, might apply to American princesses as well. At any rate, Grace Kelly's cool and sublime bearing was on fine display here. Hitchcock cloths her in discreet nightgowns and snug (but certainly not clinging) dresses that show off her delicate figure and her exquisite arms and hint oh so coyly at her subtle sexuality. She was 25-years-old, stunningly beautiful, and in full confidence of her ability as an actress. 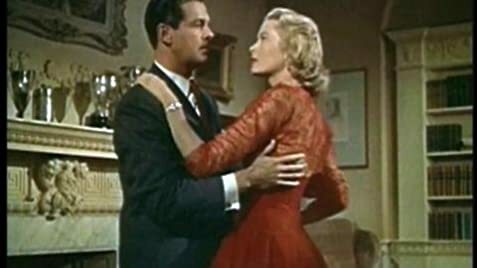 She had just finished starring opposite James Stewart in another splendid Hitchcock one-room mystery, Rear Window (1954), and was about to make The Country Girl (1954) with Bing Crosby for which she would win an Oscar for Best Actress. So see this for Grace Kelly who makes Gwyneth Paltrow (whom I adore) look downright gawky, and for Ray Milland whose urbane scheming seems a layer or two of hell removed from Michael Douglas's evil manipulations. By the way, the "original theatrical trailer" preceding these Warner Brothers Classic videos is what we used to call the "Coming Attractions"--that is, clips directly from the movie and a promo. You might want to fast forward to the movie itself. 58 of 98 people found this review helpful. Was this review helpful to you?